The Rapture - Is It Biblical? THE TRUTH ABOUT THE "RAPTURE"
Let me give you Bible PROOF right from the start why the rapture teaching HAS to be a false teaching. We are going to use a lesson from Jesus Christ Himself to show you why the rapture theory has to be a false one. Those who believe the rapture teaching are waiting for Jesus to take them away from this world FIRST, before the end. And yet the above scripture clearly shows that the church will continue to stay on this earth until the end. And the lost will be gathered first, not the church. Proof that the rapture teaching is false and that there is no separation until the end of the world. WHERE DID THE RAPTURE TEACHING COME FROM? During the great Protestant reformation, the reformers believed and taught the "historical" interpretation of the Bible and prophecy, especially concerning the antichrist. They clearly saw from the Bible and history that the antichrist was a religious system of apostasy and great persecution, rather than a future single individual. And from the evidence, it was clear that this antichrist system was none other than the Papal Church of Rome (Roman Catholic Church). This brought about the counter reformation from Rome and a new society was established in the mid 1500's called the Society of Jesus (Order of the Jesuits), led by Ignatius Loyola. Through this Jesuit order, new interpretations of Bible prophecy were introduced, placing the emphasis on futurism, rather than the accepted historical interpretation. And of course with these new teachings of futurism, the Papal church was able to divert the minds of the people away from the Roman Catholic Church being the true antichrist, to a future individual who would arise AFTER the church was "raptured" away. They achieved this by changing the true historical teaching of the 1260 year prophecy of Daniel and Revelation where the saints were persecuted by the antichrist power (fulfilled between 538AD - 1798AD, and known as the Dark Ages where the Papal Church persecuted God's people who read the Bible for themselves) to a literal 1260 days (3 1/2 years) and placed that time period in the future. They also changed the 70 week prophecy of Daniel, by taking the last 7 years and placing them, again, in the future and saying that the church would be "raptured" away before this 7 year period of tribulation, during which time the antichrist would rise. Even though there is no Biblical support whatsoever for taking the last 7 years of the 70 weeks prophecy of Daniel and placing them into the end times. The main aim of these new false interpretations was to divert people away from the truth that the Roman Catholic Church is the antichrist system that the Bible speaks of. And they were successful, as these false Jesuit teachings dominate in the mainstream Protestant churches today. IS "RAPTURE" IN THE BIBLE? Let's take a look at the very name "rapture". You will not find this word anywhere in the Bible. Not only is the word rapture not in the Bible, most Christians who believe in this teaching can't even agree as to whether they will be taken before, during, or after the seven year tribulation. There is just utter confusion on this, when there shouldn't be, as God's Word is very clear on it. It's a false teaching and in this study we will show you why. To say that Christ will rapture away the church goes against the very teaching of the end times taught in the New Testament. And as we take a look through some Bible verses, you will see that the second coming, the resurrection, the harvest and the end of the world happen during the ONE SAME EVENT. There is no mention at all of any sudden taking away of the church before the end of the world. Wow! Bible proof once more that the rapture teaching with a following 7 year tribulation period is a false teaching! Look at what it says. Yes, the Lord WILL come like a thief in the night, but what happens AT THE SAME TIME? "the heavens shall pass away with a great noise, and the elements shall melt with fervent heat, the earth also and the works that are therein shall be burned up.". No rapture and certainly no life continues AFTER Jesus returns like a thief, because it's the end of the world! Do you see a clear theme here? Friends, you have the amazing Bible truth right there! Jesus is NOT coming as a thief for the church. He is coming as a thief for the lost! For those who will not be expecting Him to return. Think about it. Would we WANT to see a thief? No. So who is it that wouldn't want to see Jesus "as a thief"? The lost! And when He does come as a thief, He will destroy the wicked and the earth will come to an END, which 2 Peter 3:10 confirms. Those who believe in a rapture say that the Greek word "parousia" refers to the secret coming of Jesus with the rapturing of the church and that the Greek word "apokalupsis" refers to the visible glorious coming of Jesus in power seven years later. So they believe from these Greek words that Christ will return in two phases, separated by the 7 year tribulation. The problem is, we have already PROVEN from the Bible that there is no separation between the church and the wicked until the END OF THE WORLD. 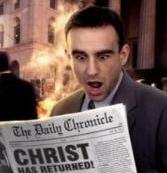 The rapture supporters also teach that in middle of this seven year period, the antichrist will reign. This is nothing but Jesuit false doctrine to take people's eyes off the Roman Catholic Church being the true Bible antichrist. But let's take a quick look at "parousia" and "apokalupsis", and what we will show you is that BOTH are used to describe the SAME second coming. Paul uses the word "parousia" in the well known so called "rapture chapter" of 1 Thessalonians 4, which we have discussed above, when speaking of the coming of Christ and our gathering together unto Him. But Paul then shows that this "parousia" will destroy the man of sin; the Antichrist ... "whom the Lord shall destroy with the brightness of his coming [parousia]." 2 Thessalonians 2:8. So we have a problem. Paul is saying that it is DURING the "parousia" of Christ that the man of sin will be destroyed. And yet those who hold to the rapture teaching say that the man of sin will reign AFTER the "parousia". And will not be destroyed until the physical "apokalupsis" coming of Christ. "Apokalupsis" [revelation] is also used in a way that indicates it is NOT a separate coming from the time the believers are gathered up. Peter said in 1 Peter 1:13 ..."be sober, and hope to the end for the grace that is to be brought unto you at the revelation [apokalupsis] of Jesus Christ;" Now why would Christians be exhorted to continue hoping to the end of the world for the grace brought through the revelation of Jesus Christ if their real hope was a rapture seven years before the revelation? Do you see the problems with this teaching? I hope so. These following verses which give Matthew and Luke's account of the same event prove that the words "parousia" and "apokalupsis" do refer to the SAME ONE COMING OF CHRIST. In Matthew 24:37 it says ..."But as the days of Noah were, so shall also the coming [parousia] of the Son of man be." ... And the same account in Luke 17:26, 30 says ... "As it was in the days of Noah ... Even thus shall it be in the day when the Son of man is revealed [apokalupsis]." This is how we are to find out the TRUTH. We need to compare scripture with scripture. So why are the two Greek words used? It's quite simple. Parousia means "presence", a VISIBLE return. And Apokalupsis means "to reveal", a REVEALING OF THE TRUTH. So to turn these two words into two separate comings make no sense whatsoever. They both describe the ONE event, the physical, visible, loud, fiery second coming of Christ, in which the truth will be REVEALED!! Another popular false teaching which is taught alongside and is used to support the rapture teaching is the left behind doctrine. This has become so popular that NOVELS have been written about it, selling multiple millions of copies. And yet, along with the rapture teaching, it can EASILY be proven false from the simple Word of our Awesome Creator and Saviour. So let us do that straight away. The disciples ask "where Lord". Why are thy asking this? Do they need to know where the one left in the field is? No. They want to know where the one TAKEN has gone. And look at Jesus' response ... "Wheresoever the body is, thither will the eagles be gathered together." ... Now the word eagles in the original language can also mean VULTURES. And where do vultures gather? Where there is a DEAD BODY! You see, the one taken is the lost and will be destroyed, and the one left behind will be saved, just like Noah was the one left behind and saved, while the wicked were TAKEN by the flood and destroyed. And contrary to belief, Lot was the one left behind and saved and the wicked in Sodom were "taken" and destroyed. The whole message of what Jesus was giving was for us to be watching and waiting for His return. His ONE AND ONLY return. So that we will not be "taken" by surprise and His second coming ends up being "like a thief" to us. And what does this false Jesuit teaching of the rapture and the left behind teaching do? It causes believers to "relax", thinking that they will not go through the tribulation that is to come and maybe even get a second chance after the church is so called "raptured". This is a teaching from the enemy friends and goes against the very teaching of Jesus that we need to be PREPARED, READY, WATCHING, WAITING for His return! Interesting statement don't you think? Why would Jesus promise us that He would be with us until the end of the world, if He was going to rapture away His people BEFORE the end of the world? The separation takes place at the end of the world, NOT before. We are resurrected on the last day, NOT before. We receive our judgment and reward on the last day, NOT before. Friends, this is the BIBLE TRUTH. Please heed the Word of the LORD, not the teachings of man! For more about the false teachings of Jesuit "futurism", see this website.